We’ve been going crazy with the pumpkin recipes this Fall, haven’t we? All of the pumpkin recipes that we’ve shared here so far have been delicious (especially these cupcakes), but these really take the cake (well, pie). 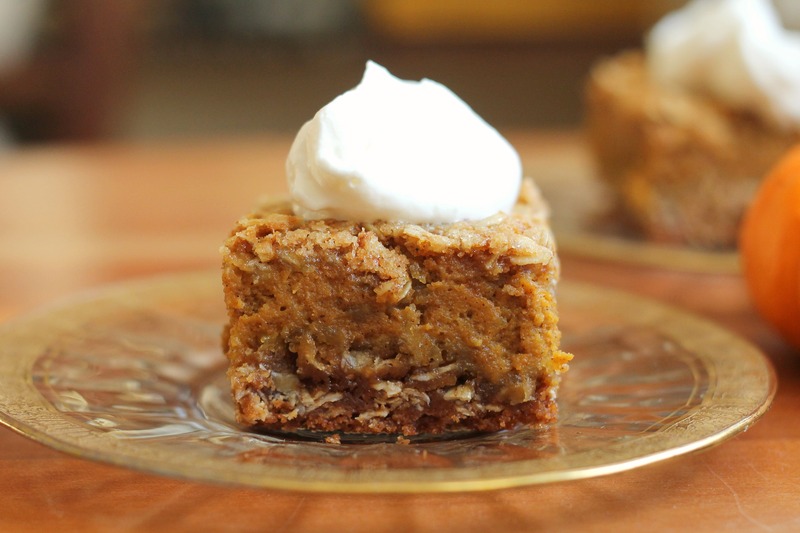 These bars entail a perfectly spiced pumpkin pie filling sandwiched between two buttery oatmeal cookies, which, as you can imagine, is delicious. They’d be great to bring to a party or for a Thanksgiving gathering because they are easily doubled to make a 9×13-inch pan that will feed a crowd. A regular old pie only feeds about 8 people, so this way there’s plenty of pie for everyone! We ate way too many of these yesterday, but I’m calling it a celebration because we finally applied to college (which is why our blog posting has been a bit sparse the past few weeks)! We’re both applying to six schools for the November 1 deadline. Five of the schools that we are applying to are the same, but our reach schools are different. Anyway, it’s great to be done with college stuff for now. I’ll be applying to a few more at the end of December! In a medium bowl, whisk together the granulated sugar (1/4 cup), brown sugar (1/4 cup), cinnamon, nutmeg, ginger, cloves and salt. Add the egg, egg yolk and vanilla and stir until smooth. Whisk in the pumpkin and then milk. Pour mixture over the slightly cooled crust and return to oven to bake 15 minutes. Remove from the oven and sprinkle the remaining crumb mixture over the top. Return to the oven to bake for about 20 – 25 minutes longer until golden brown on top and nearly set. Remove from the oven and allow to cool for 1 hour at room temperature, then transfer to refrigerator to cool 1 hour longer (it still tastes good warm, as we know from experience!). 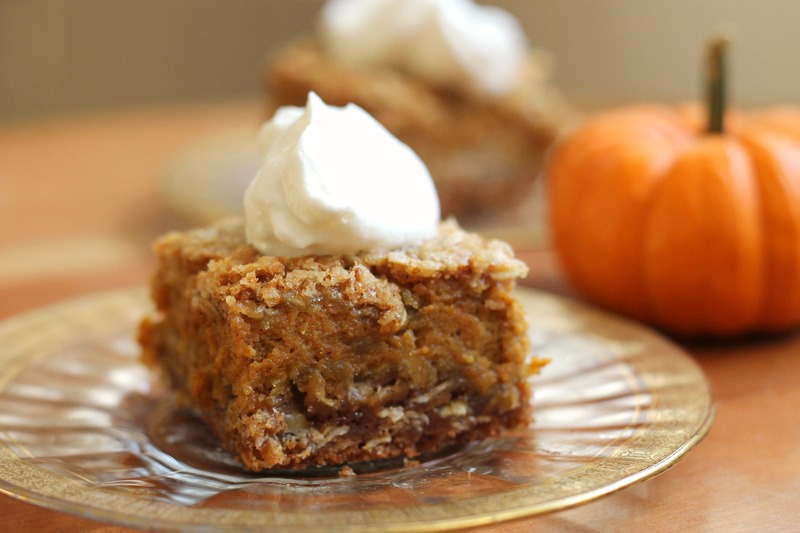 Cut into squares and serve with whipped cream. Enjoy!